Reading Magic 2 Edition The must-have guide to reading with children, now in a new and revised edition Best-selling children's author and internationally respected literacy expert Mem Fox reveals the incredible emotional and intellectual impact reading aloud to children has on their ability to learn to read. 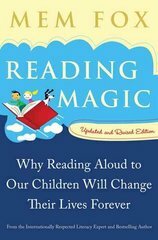 With passion and humor, Fox speaks of when, where, and why to read aloud and demonstrates how to read aloud to best effect and get the most out of a read-aloud session. She discusses the three secrets of reading, offers guidance on defining and choosing good books, and—for this new edition—includes two new chapters on boy readers and phonics, a foreword, and a list of "Twenty Books That Children Love." Filled with practical advice, activities, and inspiring true read-aloud miracles, this book is a turn-to classic for educators and parents.